Unless you’ve been living in a cave for the past ten years, you know that hybrid clubs have become popular. This trend is not without merit. These types of golf clubs are the best golf clubs for players that don’t like to hit long irons. Let’s be honest, hitting a 3 iron is hard – really hard. The name ‘hybrid’ comes from the fact that these clubs are part iron and part fairway wood – but more wood than anything else. This combination has allowed many golfers to hit high quality shots without a 3, 4, or even 5 iron in their bag. However, not every golfer has fallen in love with hybrid golf clubs and the Callaway Apex Utility iron is a great alternative. So what kind of shots can be handled by a utility iron? Is it the best golf club for shaping the ball with a long golf club? First, and most obviously, these are great clubs to use off the tee on short par fours or in narrow fairways. This type of golf club is also excellent for approach shots on par fives when you are trying to reach the green in two. Essentially, the Callaway Apex Utility is one of the best golf clubs for situations that demand both length and accuracy. With more forgiveness than a long iron and more control than a fairway wood, you may find yourself putting for eagle more frequently. Around the greens, you can even use your utility iron to play little bump and run shots from the side of the putting surface. If you hate your 3 iron and want more versatility than a traditional hybrid, this is the best golf club for you. Overall, this is forged golf club will be much easier to hit than your old long irons. 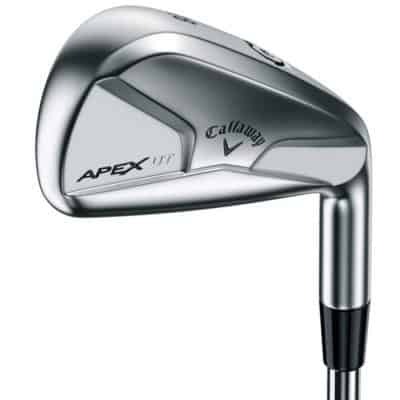 If you want more out of a golf than hybrids offer, the Callaway Apex Utility Iron is the best golf club for you.